We design and build websites and web apps for a multi-device world. Sites must effectively function and adapt to the screen size on which they are being viewed. Page load time should be 2-3 seconds for a first-time visitor, and repeat visits should be faster. Scannable, succinct and well-articulated copy helps convey a message effectively. SSL is a must-have for all websites. SSL encrypts all data shared between a user and a website. 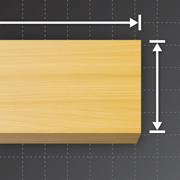 An iOS app to calculate board feet with ease. Our mobile-first concept for searching, browsing and listening to archive.org’s live music archive.